Summonded to a downed space craft, inventor Hal Stark was left with a jagged shard of metal piercing his heart after his flight simulator crashed. Dragging himself to the ship, he fashioned a suit of armor - powered by a lantern-like battery - to keep himself alive. Being such a Silver Age Hal Jordan fan, this is a personal favorite. This meeting of DC Green Lantern and Marvel's Iron Man needed to shine, so I turned to metallic spray paint and Clear Green acrylic paint. This is a relatively easy recipe once you know the steps. First, start by cutting off the belt buckle and then with resin, start to sculpt the lantern emblem, mask peaks and smooth out the "metal underwear" area. You can etch a line down the middle with a clean dental pic, toothpick or sculpting tool while the figure is starting to harden (about 1-2 hours after you apply it). The shoulder pads are from my spare parts box and were glued on and then smoothed over using resin. The emblem wass done by applying resin and then, as it started to dry, taking a sharp X-Acto and cut the outline. Once dry it snapped off easily, leaving a clean cut. Once the figure is sanded and ready to paint. I used a gray primer so the metallic paint would stick to the surface and not rub off. Next, a good metallic gold spray paint (I used Krylon 18k Gold Plate). Spray it in smooth, even strokes. If you apply too much paint, it will run and become a nightmare to clean. After about 8-10 passes, let it dry and then turn it over to check for missed spots. Spraying outside using a spray box is good for two reasons: it keeps fumes out of the house and it gives you the ambient light needed to see missed areas. Once the figure is totally gold, handle carefully and use a plastic glove or clean cloth when holding him. Using a brand-new medium brush, start applying the Tamiya Clear Green (X-25) paint with smooth passes and let it dry between each application - do not paint the same area over and over or else it will get all funky. Rinse the brush thoroughly each time as well. You can give it a gloss spray coat but I haven't seen a need for it. 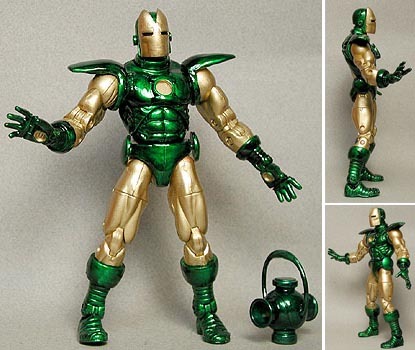 The lantern accessory was painted with a Model Master Metallic Green acrylic paint. Who's your favorite Amalgam character? Tell us on our message board, the Loafing Lounge.